I am a saver. I am not a hoarder, I have full ability to clean, purge, recycle, and toss, but I do hang on to things that I might need. I am currently reducing this collection of Might Need Someday, clumsily inching my way toward minimalism. My fridge and freezer reflect my attitude toward saving. Any usable leftover, be it tomato sauce, pinto beans, grated cheddar, or small chunks of mozzarella, can be found squirreled away in my freezer, a myriad assortment of Pyrex & Kerr & Deli containers. Items stay in the fridge if I know I’ll use in a day or two. This system usually works for me, but confusion or misidentification can happen. My favorite story of incorrect freezer ID, was the lunch I sent to work with Spouse a few years back. It was post Thanksgiving and there were turkey leftovers in the fridge and I was certain I had mashed potatoes in the freezer. Still jammied in a dimly lit kitchen, I pawed around the freezer until I found that container with the frozen white mass inside. Success! I opened it, threw some turkey on top, and packed it, the last item in Spouse’s lunch carrier. Later that day, Spouse sent what I thought was a rather cryptic email regarding his lunch, so I ignored as one of his less-than-better jokes. Pizza was on the menu for dinner and I readied my longer-rise partial Emmer pizza dough. When it came time to assemble ingredients, I pulled items from fridge and freezer: strained tomatoes-frozen, mushrooms-fresh, pesto & pepperoni-frozen, arugula-fresh, but I could not find the made-by-me mozzarella that I knew I had saved, the reason we were even having this meal, it was not in the freezer. A quick drive to QFC allowed me to purchase an inferior replacement, and pizzas were baking when Spouse returned home. Ever so smug, Spouse quipped about more mozzarella, and described to me his lunchtime experience. He had heated up his lunch, but the mashed potatoes weren’t responding as they usually did. They were remaining pretty solid and frozen. He removed the turkey and heated the rest for a bit longer. When it was finally pliable, he realized instead of potatoes, I had given him a large, healthy portion of mozzarella cheese to eat with his turkey. Delicious. He ate it, finding it completely hilarious. I was mad that I didn’t get to use my beautiful cheese on the pizza, but eventually found myself laughing out loud at the faux pas. Ok. So fast forward to this morning. In my fridge I had a baggy of butter bits, leftover butter from my current class, butter still papered but handled by kids so my assistants didn’t want it for themselves. I had taken it home, knowing I could use it in something baked. In the same fridge compartment as the butter bag, I had found another bit of something that I assumed was more butter, so all of it, plus a little more to reach 6 ounces, went into the bowl of fresh-ground Einkorn, orange zest, currants, kefir, and the leaveners. Scones for Junior on Veteran’s Day. The scones mixed and baked up beautifully. I did however notice a small anomaly: some of the butter seemed to be coagulated rather than melted-how weird! I sampled a scone and the light crisp butter/flour magic was there, along with the slight of orange, the bit of currant-sweet and…what was that? The coagulated something was cheese! That extra bit I threw in? Parmesan. Not butter. It was a tiny amount so the scones aren’t so much savory as they are confusing. I’m hoping the jam Junior adds will cover my crime, an offense his taste receptors, if detected, will not appreciate. Oh well. Perhaps it’s time for a fridge system overhaul! ps: this is the same scone I always make! When Junior was very small he ate everything. As he aged, his tastes limited, and he began to have a pronounced issue with food texture. In my very-slow-to-dawn Maternal Wisdom, I have learned to ask him whether it’s the taste or the feel of a food that troubles him. While this helps with understanding, I still feel frustration when a dish or item once tolerated or enjoyed, now causes at-table gagging or worse. I may be able to help with texture, preparing a dish a different way, using slightly different components, but taste is taste. Since Junior’s taste buds are far newer than mine, and there is a legitimate reality that he could have more taste receptors than I do, I have learned (finally) to trust his palate. This doesn’t make dinner rejections easy. Especially when I’m tired and actually tried to make a better dinner. I don’t go in for weekly menu planning solely based on alliteration. No Meatless Mondays, Taco Tuesdays, or Weetabix Wednesdays. My goal is to have ingredients in the cupboard and fridge (or freezer) that can be turned into dinner each night of the week. 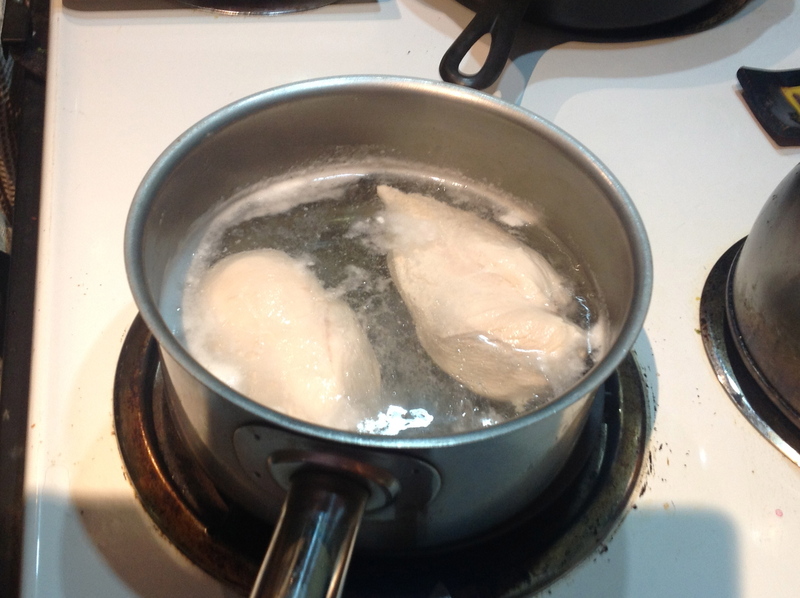 I try to keep less complicated meals for busy days, days when Junior and I might not return home until after my usual Dinner Prep Time has past. The freezer is great for these nights. Luxurious whole-days at home are good for dishes requiring long cooking times, long rising times, or time to thaw, since last night I forgot to transfer the meat from freezer to fridge. In addition to the everyday busyness of classes, read-alouds, and grammar mastery, my solo interests of writing, collaging, gardening, recipe researching, are activities that devour extra minutes, minutes that I could have used for clearing the kitchen counters for prep, mincing, dicing, or julienne; minutes for freezer-rummaging, remembering to write what we’d used up so I could remember to buy a replacement. From this slough of Not Enough Time Meets Picky Eater, emerges a basic weekday dinner rotation of: foods that have ready-made components in the freezer, foods Junior will eat, back-up foods Junior will eat when Spouse and I have something off-list, and not-really-favorites of Junior but items he will eat if very hungry, usually when he has lunch at noon, rather than at, say, 4PM. 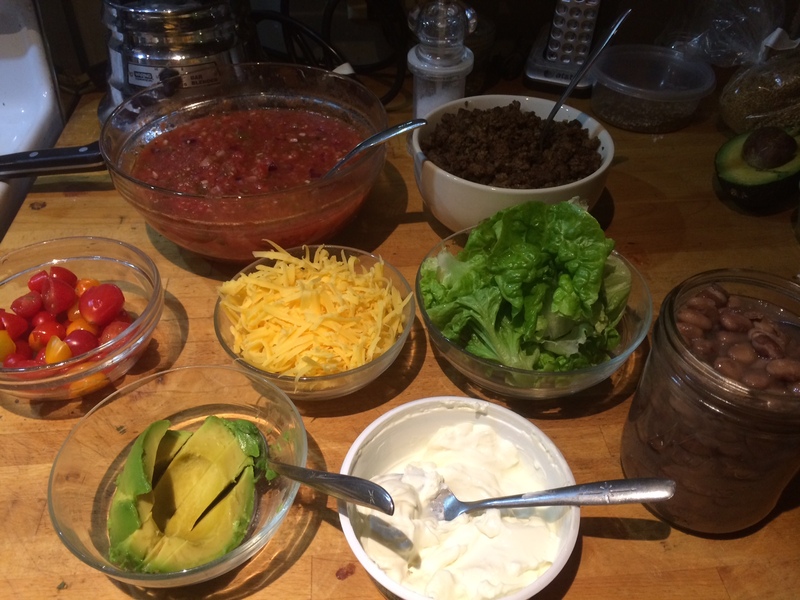 One item that fits all of my menu planing criteria is the humble taco: Beef or Chicken. While we might have an accidental Taco Tuesday, we more often have Taco Mondays or Wednesdays as those are consistent late-getting-home days. We alternate between the two proteins, changing it up each time with the accompaniments at hand. 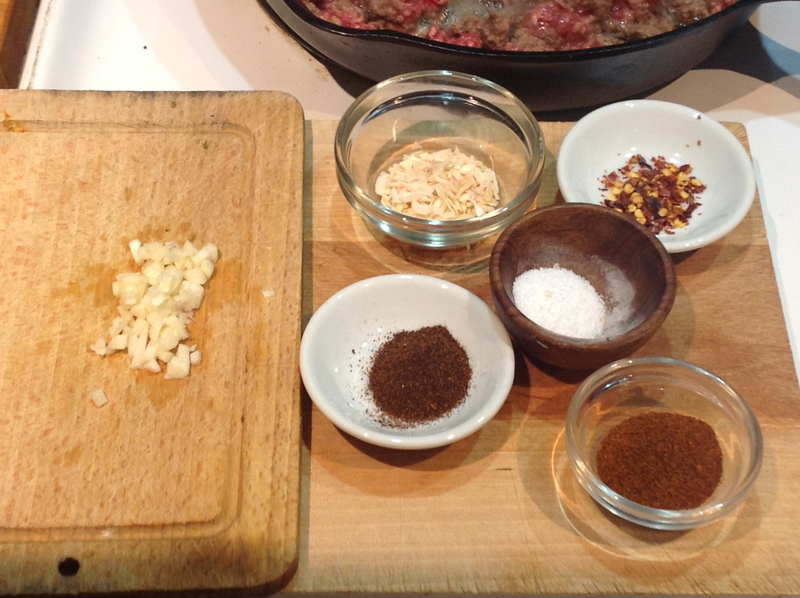 The proteins can be prepared ahead of time: chicken poached or roasted, ground beef cooked and seasoned, then all frozen in containers sized for our meal. Junior prefers a simple addition of grated cheddar, with sour cream on the side, some hot sauce for the tortilla chips, and his fruit/veggies on a separate plate. Spouse and I use less animal protein, replacing with pinto beans, also cooked and frozen in advance, and any number of vegetable combinations. For a last-minute-dinner we might have simple shredded lettuce. But our otherwise veggie options include: garlicky greens with kale or chard; raw cabbage slaw with shredded carrot, super thin onion, and cilantro; grilled zucchini and carrot; a raw shredded sweet potato slaw. If I’m really thinking ahead, I might even marinate some onions for a day or two. The salsa I prefer originates from Rick Bayless’ My Mexican Kitchen: Essential Roasted Tomato-Jalapeño Salsa. This recipe alone is worth the price of the entire book! 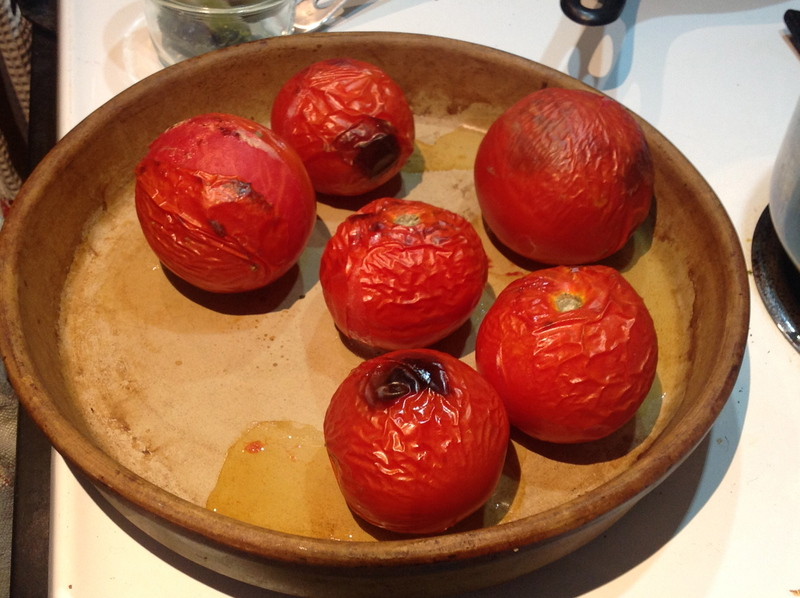 I roast the tomatoes under the broiler, peel, then add with all their juice into a food processor. 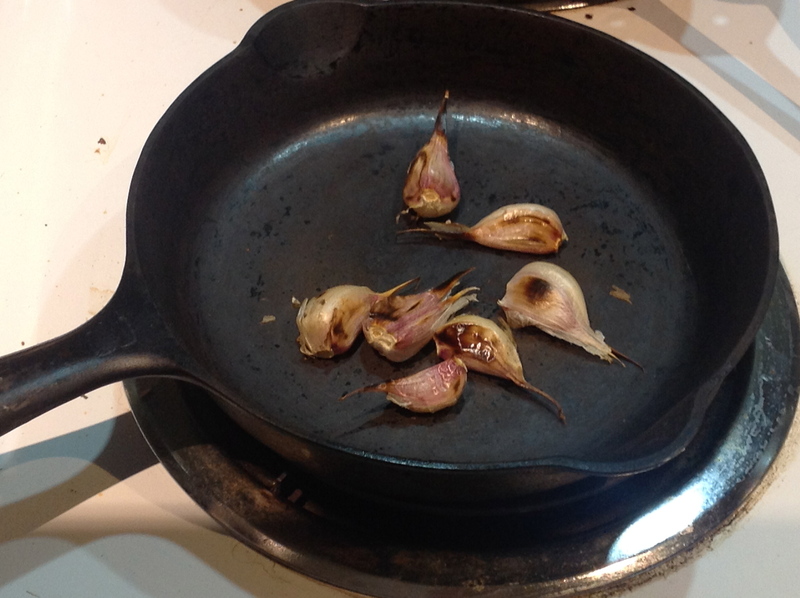 Roasted chilis and garlic, both done easily in a hot, dry, cast iron pan, stemmed and peeled respectively, follow the tomatoes into the processor. I usually use the whole chili, seeds and all. The first batch of salsa will have serious spice, but I have noticed that the spice level decreases with each round of thaw/refreeze. For anytime after late summer/early fall, I roast and freeze the chilis, picked and processed at their height of local ripeness, so we can have consistent chili heat all winter and spring. 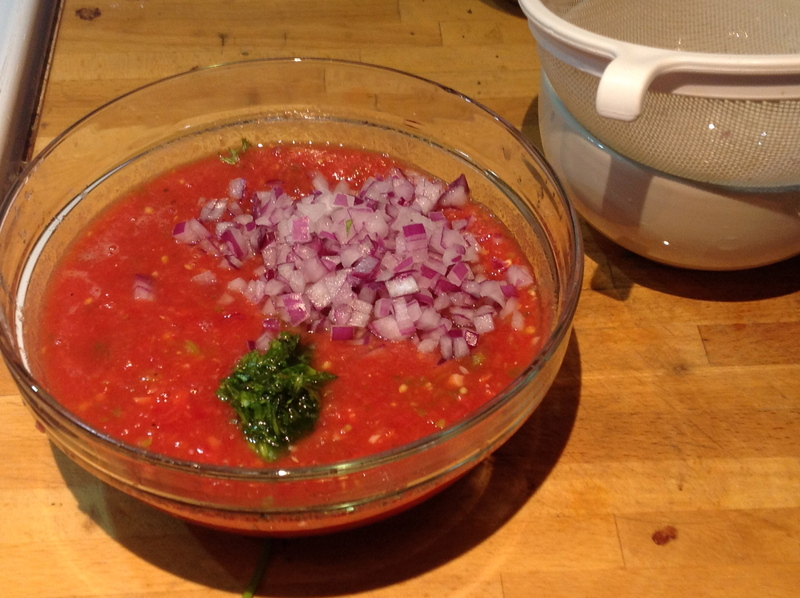 With the tomatoes, garlic, and chilis blended, I add finely chopped and rinsed red or white onion, and, if I find any in the garden or fridge, chopped cilantro. Rinsing the onion eliminates the stuff that causes tears, the stuff responsible for turning anything with raw onion rather nasty after a few hours. I make salsa and freeze most of it, so when thawed, want it to be almost as good as the day made. For the other ingredients, I have tried my hand at flour tortilla-making, and will make on occasion but generally try to have a package of my preferred coop-bought tortillas in the freezer. Sometimes I buy some cotija or queso fresco, but we generally go with Junior’s favorite “yellow cheese”, an item always on hand. On any given day, I can pull from my freezer: tortillas, cooked chicken or beef, long-soaked lightly salted simmered pinto beans, fabulous salsa. From the fridge I have cheese to grate, sour cream to spoon, and some kind of vegetable to grill, roast, or shred. If I’m lucky, I’ll have an avocado to slice. We could all have some variation of this meal 2 or 3 times a week and be quite happy. Cheers! One of our standby, go-tos!